Leave a Comment on Johannes Vermeer: Painter or Rebel? It has always been muttered that playing the guitar is the work of the devil or, more famously, that rock and roll is the devil’s music. During the Dutch Golden Age, the former was avidly believed. Whilst there were numerous superstitions bandied around during the 17th century, this one is particularly interesting as there is a wealth of Dutch guitar music and paintings of guitar playing to come from this era. The Guitar Player, c. 1672. In a society where superstition could cost a person their life (witch trials in the Netherlands in the 17th century were a common occurrence, the largest of which was the Roermond witch trial leading to the deaths of 64 people), pursuing or documenting an activity which was linked to the devil was a dangerous thing indeed. While music may just be music, and the guitar just a guitar, might it be said that Johannes Vermeer, in his depiction of The Guitar Player, was actually a true rebel of the Dutch Golden Age? If superstition was still as rife in 1673 as 1613 (the year of the Roermond witch trial) then, yes. Portraying an act considered to be of the devil may have been the 17th-century equivalent of David Bowie’s controversial “The Next Day” music video! However, 60 years is a long time. 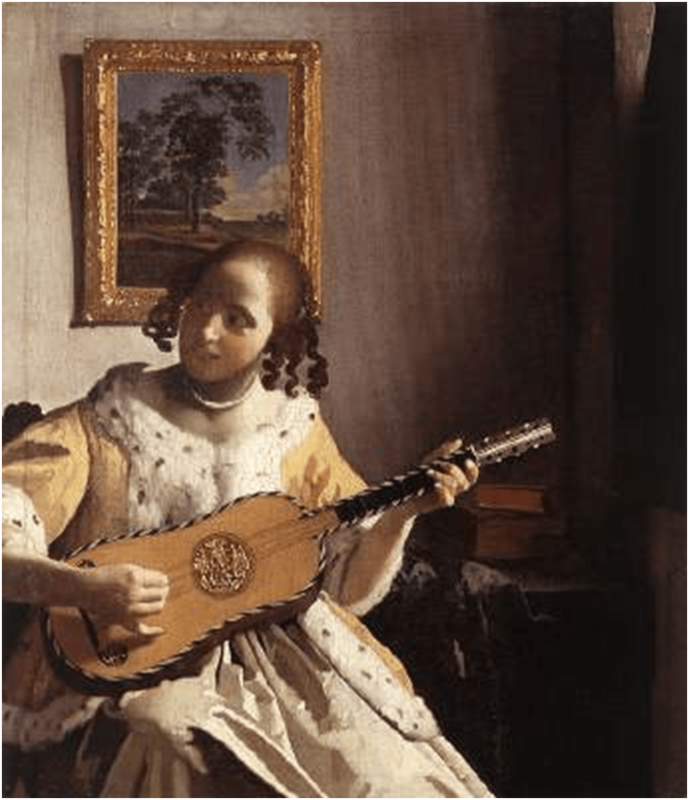 It is possible that Vermeer, in this painting, was merely completing a portrait, that he simply liked music, or even that he was poking fun at a superstition which no longer held a place in society. But isn’t it more fun thinking of the great Dutch Master Johannes Vermeer as an artistic rebel harbouring an agenda to shock society? Whether you think of Vermeer as a classical Dutch painter or a slightly more risqué artist with a bone to pick with society, you can find all you need to know about Vermeer and music at London’s National Gallery. Currently hosting the exhibition Vermeer and Music: The Art of Love and Leisure, which will be running until September 8th, this is an unparalleled opportunity to get to grips with a multisensory display. To further pique your interest, check out Johannes Vermeer by Jp. A. Calosse.